If convenience is what you're after, then the Ambient RCB On/Off Remote Control is what you're looking for. Everyone with a home heating appliance has had the thought that one of the main things that could make it better would be if you didn't have to get up to switch the settings. Remotes come in all shapes and sizes for all sorts of heating appliances. Be sure to browse our selection to make sure you get exactly the right remote for your needs. Once you've made your selection, though, you'll be amazed at the comfort and convenience a remote can provide. If the Ambient RCB On/Off Remote Control is the remote your heating appliance has been waiting for don't hesitate, get started doing things the easy way today. Will the RCB remote work with the same receiver used with the RCST remote? This remote would not work with the same receiver. You will need to utilize the receiver that comes with this remote. I am looking to replace an ambient remote (model RCB). Unfortunately, the RCB is only available as a remote/receiver combination. 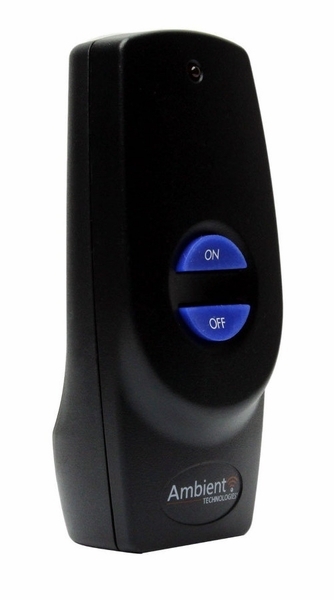 The version of this remote that can utilize a thermostat is the Ambient RCST Standard Thermostat On/Off Remote Control. Quick and accurate responses to my questions regarding parts for a 26 year old fireplace! Parts were in stock, reasonably priced, and shipped quickly. Great service! We have had our fireplace over 10 years and after a couple of years the box with the remote switch in it fell apart. The box was all plastic and after opening a closing a couple of times it broke. Well duct tape works wonders to repair but after years the remote itself quite working. I purchased this replacement and it is a much better product. The ability of being able to replace the batteries without taking the face plate. Hopefully this box will last a long time. ProsEasy to install, easy access of batteries. This is a great product!! SO SIMPLE to change out! I would definitely recommend it!! Received ambient remote in excellent time and shape. Worked as promised. Spoke with specialist online and he was very helpful in pointing out what I was doing wrong. Excellent support if you run in to a snag installing..
Super easy to install, fast shipping. Great item does exactly as I wanted. ProsEasy installation Nice Basic item that's easy to learn. I really don't see the need to make the remote as big as it is. I have seen other models that do the exact same thing that are smaller. That being said, it works exactly as you would expect. So, after an appliance goblin stole some parts of my previous remote (but seriously, I have no idea how it broke), I decided to give this universal remote a shot. Thankfully it works great, and I don't have to replace the whole system. Actually getting it in the fireplace is pretty simple. It does exactly what they say it will, and makes a good replacement for an old unit.